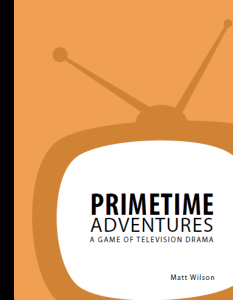 We’re back and we’re looking at Primetime Adventures, a roleplaying game that uses the techniques of serial television in imaginative ways. This may seem like an unusual topic for us to cover, given our focus on horror gaming, but that’s only because it is. In our defence, we talk about some horror-themed and Lovecraftian games we’ve played, so it’s not entirely off-topic. 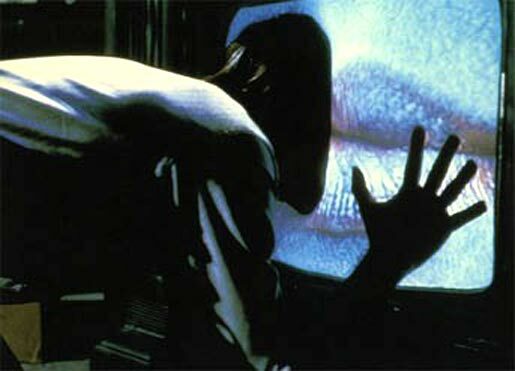 Anyway, television can be terrifying. Unfortunately, we recorded this too late to catch the Kickstarter campaign for Primetime Adventures 3rd Edition (only by around nine months). Happily, the campaign is now delivering, and we’ve received the PDF of the new edition, along with word that the physical books will turn up in the near future. 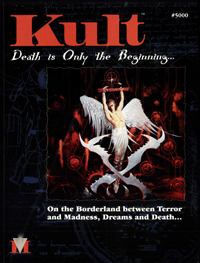 This means that it should be on sale soon at the Dog-eared Designs web store, making the game available again after a long absence. We’re not cruel enough to try to sell you on a game you can’t buy outside of hugely expensive second-hand copies. 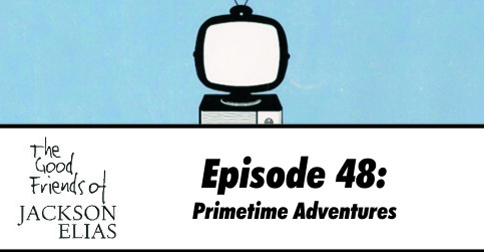 As usual, there is some dissent in our ranks about how much we like Primetime Adventures. More than most games, how much fun you have with Primetime Adventures is shaped by the enthusiasm of the people you play with and the concepts you come up with between you. If you’ve had any experiences with the game and fancy talking about them, we’d love to hear from you on social media, comments on the site or simply by shouting through Paul’s letterbox. Primetime sounds interesting & will have to look it up as it sounds quite fun. Speaking of the film/tv show related format, I wonder if any of you gents have tried Slasher Flick by Spectrum Games (on drivethrurpg)? I love the next time (on the show) idea with shows like this, on the One Shot Podcast they have a Monsterhearts game with the start/end of the show (intro sequence & next time bits, plus starting the game in season2 episode1) & commercials which fits that silly theme for it & also Feng Shui where one famous stuntman/treasure hunter (Jackie Chan) had a 4 part scenario then at the end there were the classic outtakes at the end of the movie thought up by the players. I keep meaning to try Slasher Flick, as I’ve heard such good things about it. I’ll have to make time to give it a go. Thanks for reminding me about it!